​The Ensemble Oceanic NINO Index (ENS-ONI) is one of the longest running, real-time, observation-based ENSO index that has been developed to date spanning from the mid 19th century to the present. 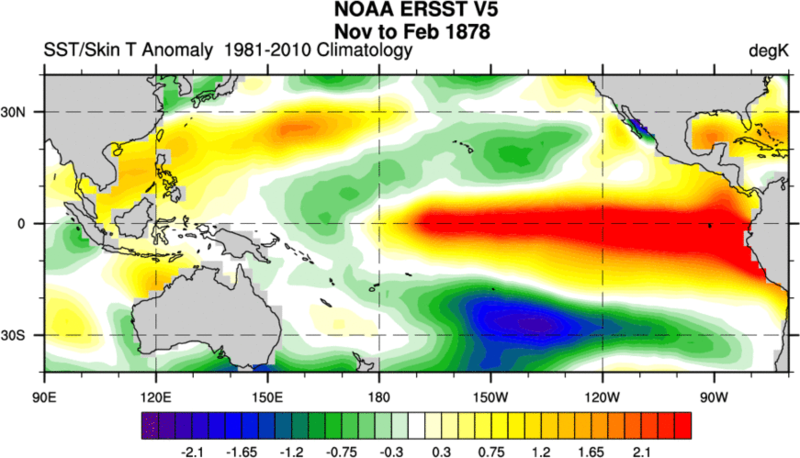 The ENS ONI closely follows the methodology of the Climate Prediction Center (CPC), and is computed by using seasonally averaged sea surface temperature (SST) anomalies in the NINO 3.4 region (5S-5N, 120-170W) over the Equatorial Pacific as defined by Barnston, Chelliah, and Goldenberg (1997). Following this publication, the NINO 3.4 index became one of the most popular ENSO indices at the turn of the 21st century. The exceptional combined intensity and longevity of the 2014-16 multi-year "Super" El Nino event in the context of modern single-year modern "Super" El Nino events in 1972-73, 1982-83, & 1997-98 spurred the creation of the ENS ONI. The ENS ONI attempts to provide as long and reliable of an instrumentally-based ENSO record as possible while maintaining simplicity in its construction and being available for real-time scrutiny. While the quality and quantity of data platforms and spatiotemporal coverage is relatively less reliable, less numerous, and more sparse respectively, the number of ENSO event samples under the ENS ONI is more than double the "reliable" record (1950-present). Figure 3. Number of datasets included in the ENS ONI (1865-Present). Discontinuous jumps before 1950 are attributable to ICOADS 3.0 passing and subsequently failing quality control. For more information on the ENS ONI and 19th-21st century ENSO behavior see my 2017 AMS Conference Poster Presentation: "A Reanalysis of the Extended Multivariate ENSO Index (MEI.ext) and Comparison of the 1877-78 and 2015-16 El Nino Events"
The following ENS ONI table (also linked above) uses a modified version of the Trenberth and Hoar (1997) definition of ENSO, wherein NINO 3.4 region SST anomalies must exceed +/-0.4C for 6 successive tri-monthly periods to be classified as El Nino or La Nina event. Here, the threshold is lowered slightly to 0.3C for 6 successive tri-monthlies mainly to identify early-mid 20th century ENSO events that may have barely missed the Trenberth & Hoar or CPC thresholds due to excessive, unrealistic damping of the ENS ONI that may still be present even after quality control. El Ninos are denoted in red, La Ninas in Blue. Figures 6-20. ENS ONI tables (by decade, except for 2005-2018). Please note that the last 2 tables are of slightly different length to ensure they fit onto the page. Measuring the Strength of ENSO events - how does 1997/98 rank?